office mum: Stop pointing at the bumps! So women are fasting and over-exercising during pregnancy to avoid weight gain - "Pregorexia", which is a dangerous obsession with staying slim while pregnant, is on the rise, according to a recent article in Grazia. They are desperate to maintain their pre-pregnancy figures as far as possible, and to avoid putting on weight that will be difficult to lose afterwards. The article quotes results from a poll : 10% of mothers worry most about childbirth complications while a huge 65% worry about not losing weight after their baby is born. Fasting and over-exercising clearly isn’t healthy for the expectant mum or her unborn child – low weight gain during pregnancy is linked to low birth weight babies. But who can blame them? We live in a culture that demonizes weight gain of any kind, a tabloid society where every celebrity lump and bump is highlighted on the front page of magazines and red-top newspapers. No doubt now that royal-baby-watch is over, Kate will be subjected to royal-baby-weight-watch. As I read though the Grazia article it reminded me of the RTE documentary “What’s Ireland Eating” that covered among others, the topic of pregnancy weight gain – this time from the other perspective – excessive weight gain. I remember feeling annoyed at the tone in that segment of the program. Yes we all know that excessive weight gain is not a good idea, any more than fasting, and yes it can lead to a difficult labour and future health problems. But I was left feeling that expectant women were being treated like disobedient children who don’t know what’s good for them or how to make their own decisions. You're damned if you do, you're damned if you don't. There's a small window of perfect weight gain and woe betide any woman who falls outside this. And oh how the comments come, thick and fast - pregnancy is the one time in a woman's life that she seems to be an open target for direct, blunt, insensitive comments about her size - big or small. Again, to reiterate, I know that too much weight gain is not good, but talking about women as though they are difficult children who need to be managed is unhelpful. There are more constructive ways to support women in achieving a healthy pregnancy weight. Health care professionals could explain the benefits of managing weight when women first attend - many women already know the reasons for this, but not all do. And some doctors don't mention it at all. To say nothing at the outset but then criticize women afterwards for not living up to expectations is not the solution. and she's not even wearing..Spanx"
I don't need to spell this out. But I want to say it anyway. The same magazine that published an article on eating disorders in pregnant women who feel pressure to avoid baby weight, focussed just a few pages later on how wonderful it is that Fearne Cotton has lost her baby weight. No wonder we're so screwed up. No wonder we're so obsessed with weight. 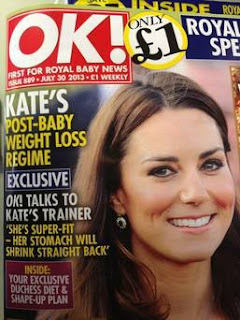 No wonder society thinks that the holy grail for every new mum should be getting back in shape. Because there's so little else to do when you've just had a baby. It's not just magazines - I remember a glowing Pippa O'Connor appearing on the Saturday Night Show in April, just two weeks after the birth of her first baby - the audience applauded her for looking so good. She did look great, and I don't intend this as any kind of negative comment towards Pippa. But why are we clapping? And how is the average new mother supposed to feel watching this? The pressure is on - don't gain too little or you'll endanger your baby, don't gain too much or you risk a more difficult birth. Anything you do outside the narrow confines of "advice" given to pregnant women could affect your child - for God's sake don't eat coleslaw or goat's cheese whatever you do. You irresponsible woman. Sigh. As long as we continue to demonize women for trying to stay slim, to criticize them for putting on excess weight, to point out every famous lump and bump, and to literally applaud celebrities for losing baby weight, we're not winning.